The Dhammakaya Foundation is presently one of the most important organizations representing the Dhammakaya movement founded in 1916 in Thailand by Phra Monkolthepmuni, the abbot of Wat Paknam Bhasicharoen. Following the death of Phra Monkolthepmuni, the Foundation’s work was continued by his disciple Khun Yay Mahā Ratana Upāsikā Chandra Khonnokyoong, a Buddhist mae chi. The Dhammakaya Foundation was particularly interested in encouraging the study of meditation, which was not widely practiced by Theravada monks in the early 20th Century, and was virtually unknown to most lay Buddhists. 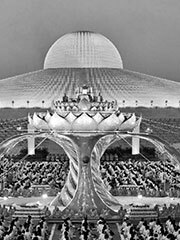 In 1970, a temple was constructed to house the movement, called Wat Phra Dhammakaya. Located in Khlong Luang, Pathum Thani, the temple was intended to become an international center for the study of meditation. With its architecture, it resembles a large stadium or spacecraft. 300 thousand gold statuettes of Buddha are installed on its dome. 700 thousand more is located inside the temple. The dome is surrounded by a platform for meditation. The temple is home to about 3,000 monks, novices and laity.